Given, the busy lives that we lead today, with erratic work and sleep hours, coupled with stress and unhealthy lifestyle, it gets increasingly difficult to prevent the onset of some common lifestyle diseases. To prevent lifestyle diseases such as diabetes, obesity, high lipids and high blood pressure, we should first adopt a healthy lifestyle. It is said that majority of the lifestyle diseases are preventable and even reversible in their initial stages, when you lead a naturally healthy lifestyle. Preventing lifestyle diseases can keep your heart healthy. Being a muscular organ, which works like an engine, the Heart provides fuel to run human body by pumping blood. The chambers of the heart serve as a multiple step pathway for blood, to be first sent to the lungs for respiration, and then, it would be supplied to the body’s cells to keep us alive. Each time you breathe, the valves of the heart opens and closes. Even a minor obstruction to this muscular organ, can lead to heart diseases, referred to as cardiovascular diseases. This is caused due to the blockage in blood vessels, fatty plaques of arteries, or lack of strength of heart muscles. 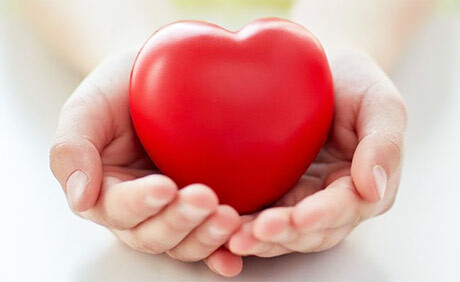 Statistics reveal that heart diseases are the leading cause of death of both men and women throughout the world. But, Ayurveda and modern science suggest that there are various things that you can take care of every day, to keep your heart healthy. Here are some suggestions that can help you get started. Choose at least some of the methods that you can incorporate in your routine to begin with, while adding one or two more every few weeks, until you slowly begin to lead a heart-healthy lifestyle. Ultimately, it is not just your heart, but your whole body that will thank you. It doesn’t make sense to say that we should try to lead a stress-free life, as stress is a part of our daily lives in the current world. Therefore, although we cannot avoid stress, learning effective stress management is what is more important. Mental and emotional stress can disrupt your emotional being. So practice of yoga and meditation techniques can do wonders in helping you manage stress. Talk to experts who can help you with this matter. Enrol in a yoga class and do breathing exercises regularly. Transcendental Meditation is also highly beneficial, as research has proven that it helps lower blood pressure, reverses arterial blockage, and provides resistance to all types of stress. Some Ayurvedic herbs like Arjuna and Ashwagandha are known for their positive influence on the mind and emotional heart. While doing all that is possible to keep stress at bay, it is also essential to seek ways in maintaining your mental and emotional well-being, which can help the emotional heart flourish. The focus here is on maintaining ‘ojas’, the energy or substance that maintains life. It is the finest by-product of digestion and master coordinator of all activities of mind and body, which leads to contentment, vitality, longevity and bliss. Maintaining inner strength and poise and maintaining positive attitudes can increase ojas. Therefore, make it a point to set aside some time daily to do activities that you love to do, the ones that give you contentment and happiness. It could be something simple as listening to an uplifting music, enjoying serene natural beauty, aromatherapy, or sipping herbal tea. Simultaneously, keep away from situations that distress you. Following a heart-friendly diet is one of the most important steps that you could adopt towards heart health. But, being in a society that is used to fast food and eating-on-the-go, this may be the most difficult to implement. But, begin with small things like including more servings of fresh vegetables and fruits, starting your day with stewed apples or pears, including soaked and blanched almonds in diet, including heart-healthy spices like fresh-ground black pepper, turmeric etc. Make healthy food choices, like for instance, choose fresh foods over processed foods or leftovers, light foods over rich and deep-fried ones, go for warm and cooked foods over cold, heavy foods. If possible, talk to your physician and use immunity boosting herbal supplements, that also help reduce LDL cholesterol and plaque build-up. Practice mindful eating. Eat moderately, as Ayurveda says, the ‘portion’ that fits in your two cupped palms. But, make sure you do not skip meals, as eating meals thrice a day at regular times trains your system to anticipate and digest food. If you suffer from sluggish digestion, you may stimulate it with a drink made of ginger, salt and lime. Include buttermilk as part of your diet during lunch. This can be spiked with roasted and ground cumin and fresh cilantro for flavour. Also, remember not to eat too late at night, as it can gets taxing for your system. Toxic matter builds up in your blood vessels due to arterial plaque, referred to as ‘ama’. The build-up happens when your physiology cannot get rid of it efficiently. Ayurveda recommends an internal cleansing program for every change of season to flush out ama. There are specific herbal formulations too that can help in cleansing ama out of the body. Among the other things you could do are drinking plenty of warm water through the day, getting to bed on time so that your body cleanses itself during the natural purification time, eat a high-fibre diet rich in fruits, veggies, whole grains, nuts etc. Avoid use of alcohol and tobacco. It is not necessary to go through a strenuous workout regime to keep yourself healthy and fit. The key is moderation. Workout five days a week, but make sure you do not exert your muscles too much. Walking is a great exercise, ideal to be practiced by one and all. Taking the 30 minute walk every morning will not only help your heart, but will prepare you for the day by boosting your circulation and your metabolism. Speaking about exercise, do not forget to include yoga as part of your daily routine. Yoga helps in building cardiovascular health and boosting your lung capacity. A review in the ‘European Journal of Preventive Cardiology’ has indicated that yoga can help lower risk of heart diseases as much as conventional exercises like brisk walking. Several research studies have proven the link between sleep deprivation with blood pressure, depression, and other factors that increase risk of heart diseases. Ayurveda considers sleep just as important too in maintaining health. Therefore, practice good bedtime habits. Do calming activities before bedtime like switching off other distractions from your bedroom such as computers, television and other work material. Stay away from stimulants towards evening and get to bed early to remain energetic through the next day. Ayurveda, as always, focuses on prevention in the first place, and in case there is a problem, focuses on the deep root cause of the disease. The best way out to prevent onset of heart diseases is to adopt a holistic approach in life, such as Ayurveda, and live based on these ancient principles. In fact, some researchers have even proven that some heart diseases are reversible with the help of Ayurvedic treatment and herbs. Triphala (reduces high cholesterol and keeps heart healthy), Ashwagandha (relieves mental stress and strengthens heart muscles), Chyawanprash (boosts immunity and strengthens heart muscles), Arjuna (pacifies pitta and nourishes the heart), Guggul (lowers cholesterol), turmeric, ginger, garlic, saffron, are some herbs that are good for heart diseases. Speak to an expert Ayurvedic physician for proper guidance before taking any herbal supplement.